3 Pep Fet – Damn Life is Good! There comes a time during each summer when some people crave something other than grilled meat and farm fresh, healthy vegetables and fruits. You know who you are. This recipe combines both a rich and decadent cream sauce and noodles with fresh veggies and herbs. You get a luscious combination that will neither put you in a fat-induced coma nor give you the d.t.’s from freshness. Serves 4. Mix all ingredients and marinate chicken over night. Pre-heat oven to 375. Bake chicken in marinade for 45 minutes or until done. Cut into strips and reserve juices. *I’ve tried this with blackened, grilled chicken which is good but the juices from the cooked chicken are really what makes this dish. Melt butter and saute peppers about 2 minutes. Remove from heat. Stir in wine and broth. Heat on high until sauce reduces to 2 T. Add cream and reduce sauce by half. Add juices from cooked chicken. In another skillet, saute mushrooms. Cook noodles per package directions. 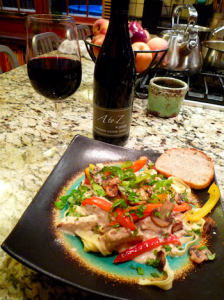 Combine mushrooms, peppers, noodles and toss with cream sauce. Place on platter and top with chicken, parmesan and fresh basil. Serve with light salad and bread. You’ll be glad you did.